A lighter and stronger frame has been developed for the FUSO SuperGreat series. These engineering enhancements, including side-rail and cross-member web rivets, have made the chassis much lighter and more durable, suiting it to any load requirement or road conditions. One engine model, designed with fuel economy as a prime output, powers the entire range. At 12 882cc displacement, the FUSO in-line six, turbo-intercooled diesel engine provides up to 257kW of power, and 1 620Nm of torque, in our line-haul Truck Tractor and Tipper models (the Tipper has a tried-and-tested 10-speed gearbox). Items that need regular checks are located under the front panel, which lifts up for direct access. And modified hinges allow for 45-degree cab-tilt for easy access. FUSO SuperGreat trucks are equipped with a dual-circuit air braking system, including ABS. Thicker brake linings improve the truck’s braking performance. They also last longer, extending the vehicle’s time between maintenance intervals. 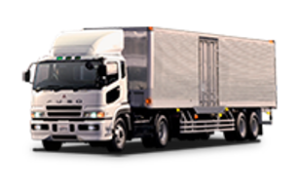 All FUSO Cabs are crash tested for the safe protection of the driver and passengers.